Sparkling wines like champagne and prosecco aren’t just festive – they also go extremely well with cheese. Lighter cheeses in particular really come alive when served with sparkling wine as the crispness and bubbles bring out the best in the cheese. But aged cheeses with nutty nuances and strong blue cheeses also liven up in the company of bubbles. How often do you drink champagne with cheese? Or with food in general? Probably not often enough, in the opinion of wine experts. Real champagne lovers swear that champagne goes with everything. And according to connoisseurs, champagne is actually the perfect wine to serve with food. And this means cheese, too. Champagne pairs extraordinarily well with cheese, with the complex aromas in the wine and the equally complex tastes from the cheese producing a bubbly explosion of flavor in the mouth. And this isn’t just true of genuine champagne from the Champagne district in France. It also goes for many other sparkling wines, including cremant from other parts of France, prosecco from Italy, cava from Spain and sekt from Germany. So don’t hesitate to bring out the bubbles the next time you serve cheese. And be prepared to discover an exciting world of aromas and flavors, palate-rinsing acids and the delightful lightness that sparkling wine is known for. Sparkling wines are often acidic white wines with refreshing effervescence. And it is this unique combination of acid and bubbles that perfectly rinses the palate after a rich piece of cheese. The wine literally clears the way for the next bite so you can enjoy it fully. The acidity in many sparkling wines makes them excellent partners for a wide array of cheeses. Mild white mold cheeses, like brie and Double Crème, bring out the fruity nuances of the crisp acids, which at the same time help to cut through the fat. The same holds true of aged cheeses, where the fat content is often higher. Even blue cheeses are complemented by the acidity – especially if the wine also has some punch and perhaps a touch of residual sugar to rein in the bitter mold flavors. The fresh, slightly sour taste of goat’s cheese also goes well with a crisp sparkling wine. In this case, it is again a good idea to serve a wine with some body, as a very light wine can easily become overwhelmed by a very flavorful goat’s cheese. Sparkling wines come in many varieties and price ranges. With the less expensive varieties, such as prosecco from Italy, cremant from France and cava from Spain, you will often find good quality at a reasonable price, and there is an impressive range of good wines to choose from. Italian sparkling wines are often sweeter – for instance a refreshing asti spumante – while Spanish cavas are more acidic. And then we have genuine champagne, which must come from the Champagne district in France in order to bear the name. These elegant wines are often on the sour side, but there are also sweeter varieties. A good rule of thumb is the stronger the cheese you’re serving, the heavier the wine should be. Young, uncomplex wines with a nice acidity – from Champagne, but also from Spain – go well with lighter cheeses, while the heavier and often more aged sparkling wines are wonderful with aged cheeses. First-class sparkling wines – especially from Champagne – often have nutty and sometimes breadlike aromas, which complement aged cheeses nicely. Cheese like aged gouda and mature cheddar are very flavorful with a high salt content and lots of sweet, nutty nuances. You’ll want to serve a more expensive and complex wine with these types of cheeses. A good choice would be a vintage champagne or cava, where time has allowed a complexity of flavors to develop while reining in the acidity somewhat. People say that extra-strong and dry cheeses, like parmesan, are the perfect accompaniment to a good, aged sparkling wine. And they are definitely on to something, because in fact you find the same buttery and nutty nuances in a very good aged champagne, cremant or cava. An Italian red lambrusco of better quality can also make an interesting pairing with a variety of cheeses. 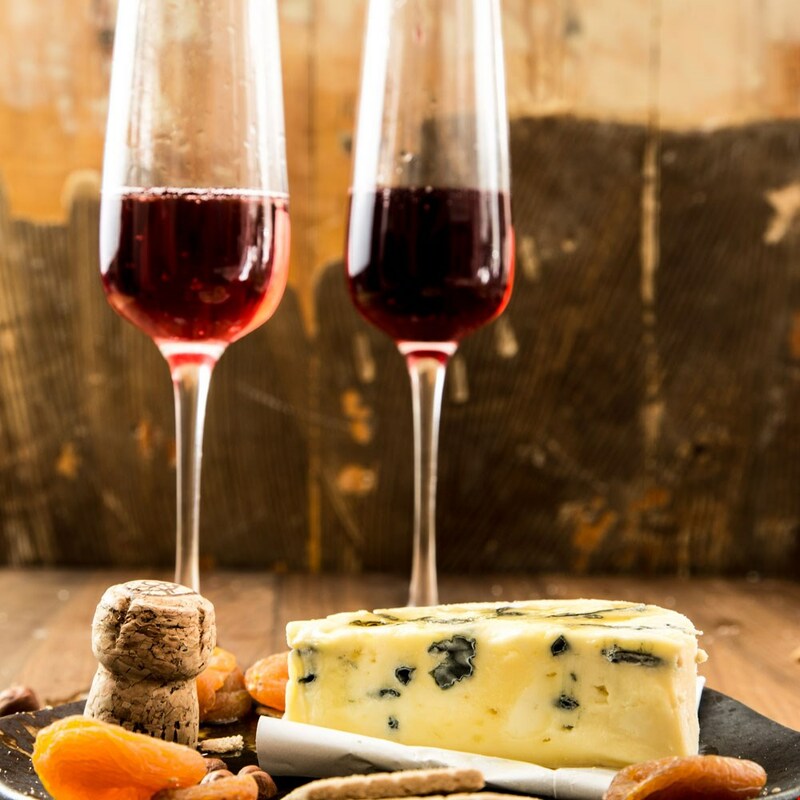 Generally, red wine isn’t actually as good with cheese as many people think, but lambrusco’s crispness and effervescence actually make it a lovely cheese wine – especially if it isn’t too sweet. There are also very sweet varieties of sparkling wine, which you should be a bit careful with. Sweet wines normally go quite well with cheese, but in order for the sweetness to work, it has to be accompanied by high acidity. And that can be hard to find in sweet sparkling wines – especially the less expensive ones. You might recognize this from the sweet Italian asti. It is a very sweet wine that tastes almost like an alcoholic cooler. This type of wine can be delightful on a hot summer day, but as an accompaniment to cheese, it doesn’t make the grade. It is just sweet on sweet, which doesn’t do anything for the cheese. Cheese loves honey, apricot and raisin nuances – especially aged cheeses – and these nuances are more often found in aged wines. If you want to serve a sweet sparkling wine, you will have to make a bit of an investment to get one that goes well with cheese. 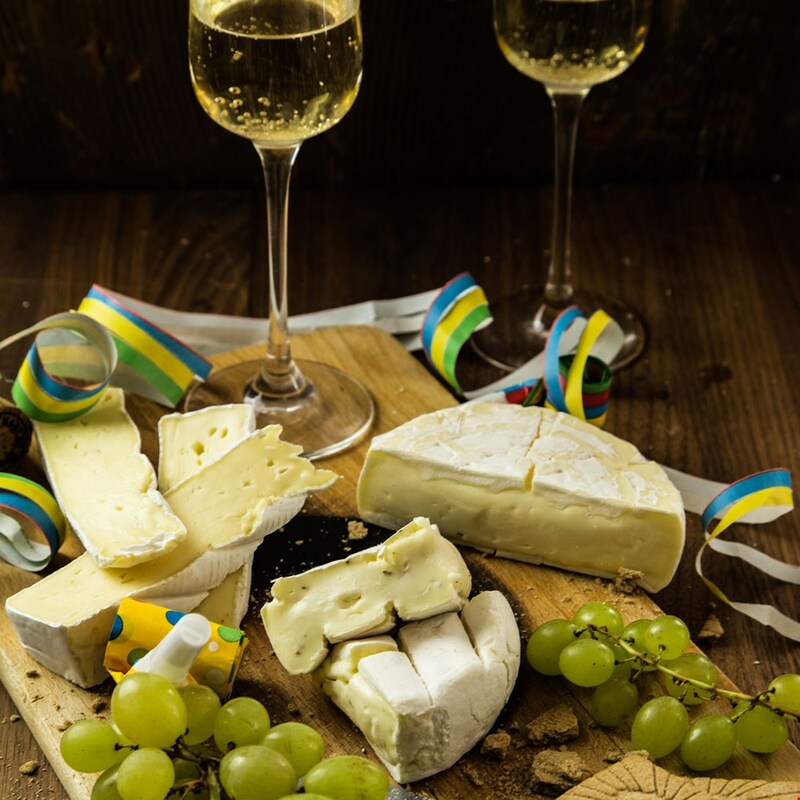 A good demi-sec champagne or a sweet variety of a German sekt riesling will pair nicely with cheese, where the complex sweetness and accompanying acidity can raise a blue cheese to amazing heights. The world of sparkling wines – like the world of cheese – is vast and complex. And even though there are many helpful tips, there are no hard and fast rules. The bubbles and the often complicated production process for sparkling wines bring out special aromas which make them different from similar white wines. At the same time, the bubbles do things to the cheese that other wines don’t. The best advice is, as always, to experiment. Buy a couple of good cheeses, pop the cork on a bottle of bubbly and start tasting. Nibble a little cheese, then take a sip of wine. Enjoy the bubbles and the flavors as they develop. And then ask yourself... Do I like how this tastes? If not, then try a different cheese or a different wine. Seven tips to styling and arranging your cheeses! Styling your cheese board is really half the job! We eat with our eyes first so don’t underestimate how your cheese board looks. Wow your guests with just a few tips to improve both appearance and taste.